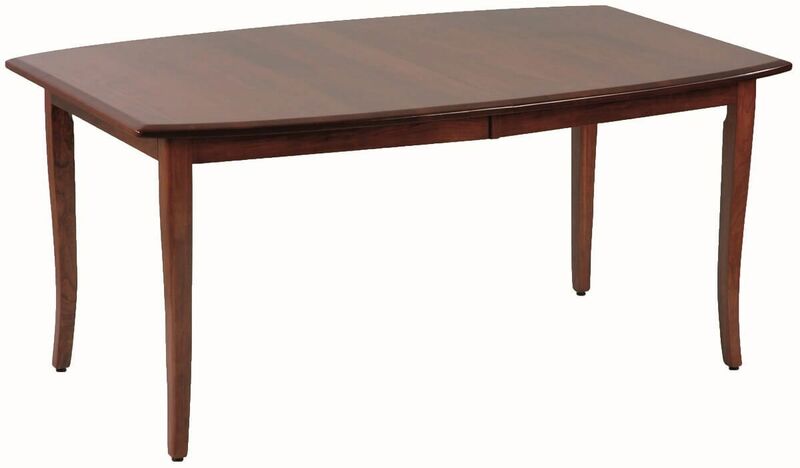 A splayed leg and Contemporary boat shaped top make our hardwood Hughes Street Leg Table a modern, Shaker statement customized to your personal taste. Choose your hardwood, and our Amish artisans will hand select the pieces that become your Hughes Street Leg Table. Select your wood stain and our professional finishers will hand rub it to a consistent finish. Choose the size, leaves, and other options that make your Shaker style table perfect for your home and Countryside will deliver it to your home. Your Hughes Street Leg Table is available in nine wood species, six base sizes, and a number of stains or specialty finishes. Depending on the size you select, the leg table can accommodate up to 20 extension leaves. **After the 5th leaf, self-storing options may change. ***Additional center legs are added for long tables. ****Base dimensions do not include leaves, each leaf adds 12". Options may vary based on wood and size selections. Additional leaves may not be purchased at a later date.